“Frog & Toad” is the rare children’s phenomenon to break though to wider audiences, even enjoying a run on Broadway. 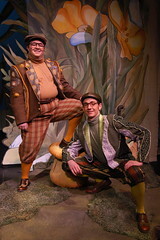 Audiences are taken by this cheerful musical stage adaptation of Arnold Lobel’s beloved, bespectacled best buddies who wake from hibernation and enjoy a year in the swamp together. It’s set to a surprisingly sophisticated score with beautiful harmonizing that evokes 1940s swing.